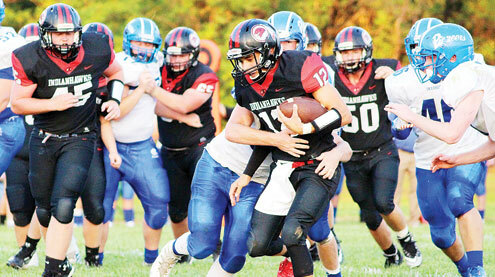 The Clopton-Elsberry IndianHawks nearly grabbed a two touchdown lead in the first half of their season opener on Friday, but a pair of setbacks sent the momentum to Duchesne in a 27-19 defeat to open the 2018 season. The IndianHawks took an early lead when Shawn Yates connected with Justin Jennewein up field to set up another hookup with Jennewein in the middle of the end zone for a 7-0 lead. In the second quarter Clopton-Elsberry crossed the goal line again as Shawn Yates ran in from four yards out, but the score was wiped away on a holding penalty against the IndianHawks. On the very next play Yates was intercepted on the goal line to end the drive. The Pioneers took full advantage of the turnover, scoring in the final minute, tying the game 7-7 at halftime. Duchesne got the ball again to start the second half, scoring on their first possession of the quarter on a pass from Mitchell DeGuentz to Hank Thro for a 14-7 lead. The IndianHawks struck back immediately when Eddie Bonstell busted through Pioneer coverage for an 85-yard kick-off return for a score. A missed facemask call on the defense led to Clopton-Elsberry being stopped on a two-point conversion, leaving the IndianHawks a point behind. The high scoring quarter continued less than two minutes later as Nathan DeGuentz ran the ball in from 30 yards out. Down 21-13, Bonstell returned his next kick 57 yards for good field position for his IndianHawks. His second great return set up a Shawn Yates five yard touchdown, pulling the home team within two points. The IndianHawks came up empty on the two-point try that could’ve tied the score. The Pioneers scored early in the fourth quarter for a 27-19 lead. Clopton-Elsberry got the ball moving late in the fourth quarter and had four chances at the end zone as time wound down. Yates threw four balls, but couldn’t connect with his targets as the IndianHawks fell by eight. Coach Ben Burnett noted the team did a good job against the well-coached Duchesne team. “They executed their game plan better than we did. We gave up over 300 yards rushing, which is not what we were expecting. They couldn’t pass the ball on us and they decided to break us down with the run,” Burnett explained. “Offensively, we did a fair job of executing our game plan. We got to a 7-0 lead but gave up a TD right before half. Coming out of the half, we didn’t compete like we would’ve liked, and three interceptions hurt us. We did score another offensive touchdown in the third quarter and a kick-off return for TD in the fourth. We fell short of a last second drive on 4th and goal as we dropped the final pass in the end zone with 10 seconds left in the game. We’re looking to make slight adjustments on both sides of the ball to be able to sure up the holes in our game,” he remarked. Eddie Bonstell’s two great kick returns earned the sophomore the Community State Bank TribCast Player of the Game. The game is available in the TribCast archive at www.thepeoplestribune.com. Clopton-Elsberry will play at Missouri Military Academy this Friday in week two action. Despite being down by two points at halftime, 16-14, Bowling Green came roaring back in the second half to defeat South Shelby 43-24 on the road in the first week of the 2018 season. Coach Kevin Krietemeyer noted that he was pleased with the team’s effort. He pointed out the team had 324 yards rushing on 44 attempts and was 4-8 passing with 27 yards for 351 yards of offense in the season-opening game. Kaleo Dade had a big night with 25 carries for 157 yards, three touchdowns and a two-point conversion. Defensively he had seven tackles, five assists, a sack and a forced fumble. Austin Callahan had 11 carries for 94 yards (8-yard average) and was 4-8 throwing for 27 yards and one interception. He also had three tackles, three assists and intercepted the ball three times, twice for a touchdown. Dylan Huber had five carries for 61 yards (12-yard average) and a touchdown. He’s also 1-1 on extra point attempts and had a tackle and two assists defensively. Gavin Deters had three carries for 12 yards. Lane Parker had two catches for 17 yards in addition to a tackle and an assist. Kyle Horner had one carry for five yards along with three tackles and two assists. Kam Worley had a catch for five yards. Andrew Biggs had a good night defensively with seven tackles and two assists. Hayden Finley had three tackles (one for a loss) and two assists. Deonta Fleming notched five tackles and two assists and Braden Perez had five tackles and one assist for the night. The Bobcats will hold their home-opener this Friday, Aug. 31 as they host Palmyra of the Clarence Cannon Conference. The Louisiana Bulldogs opened the 2018 season against Mark Twain on Saturday, Aug. 25 with strong fan support on the road. Despite a tough battle against a strong team, the Bulldogs fell in the first game of the season 54-34. Coach Joe Calhoun was impressed with his team’s performance in the first game. “Our kids played with everything they had, we just have to get in better shape so that they have more to give,” Calhoun remarked. “We have to improve our pad level and run fits on defense and our focus and tenacity on offense,” he said. Derek Richards put up big numbers for the Bulldogs on Saturday. He had a 61-yard touchdown reception from Cameron Henderson. Richards also had an 80-yard kick-off return TD and a 16-yard touchdown run. Cameron Henderson threw for touchdowns to Cody Love, one of them 71-yards and one of them 49-yards. Other stats were not available as of press time. The Bulldogs will travel to Van-Far on Friday, Aug. 31. That game will be featured on TribCast at www.thepeoplestribune.com. The Van-Far Indians rang up their first win of the 2018 season at home on Friday, Aug. 24 in a big 32-0 victory over Bunker Hill. The Indians offense notched 269 yards rushing and 56 yards in the air for a total of 325 yards. The defense held Bunker Hill to just nine yards rushing and 14 yards passing for a total of 25 yards of offense for Bunker Hill. Quarterback Eric Hombs had 17 carries for 119 yards and was 4-12 for 56 yards passing. He racked up a total of 175 yards of offense including three touchdowns. Verlyn Johnson rushed six times for 53 yards and had a two-point conversion for the Indians. Ben Cassiday had six carries for 33 yards including a touchdown. Morgan Slatten had five carries for 28 yards and scored a TD on an interception. Bryson Lay had five carries for 51 yards and Tony Garland rushed four times for five yards. Logan Wilson had two passes for 45 yards and Tyler Robinson passed twice for 11 yards. The Indians will host Louisiana on Friday, Aug. 31. The game is slated to be featured on TribCast at www.thepeoplestribune.com.